If I ever get a Tattoo it probably be of the Avedon pic of John, y'all know the one-The pshycedlic John portrait thats on the back cover of the "1" booklet.But i doubt i would, I'd probably get tired of it after a while, especially when the colors fade! That's why my tatoo is black.Black fades evenly. I only plan on getting 1 tattoo. A black peace sign on my shoulder. Not Beatles related, although i like the idea of the Sgt. Pepper drum. Challenge The Blue Meanie in the Arcade! Well, Here is one. Be sure to tell me what you think. Challenge soliddrummer in the Arcade! i have four tattoos, closest one to the beatles is the gretsch guitar on my back. i'd like to get a beatles one, but i'm not sure i'd want it forever. i'm already iffy on the ones i have. that is a cool tattoo sd....I like it. I think I won't never take The Beatles tattoo. I love and adore Beatles, but tattoos are not for me. soliddrummer, your tattoo is very cool! And you have designed that yourself?! Oh..! It's cool and nice! Beatles is very beautifull thing and so Beatles tattoos are always beautifull! But I hope I can be a real fan without Beatles tattoo. Challenge Opa in the Arcade! that's so kool. 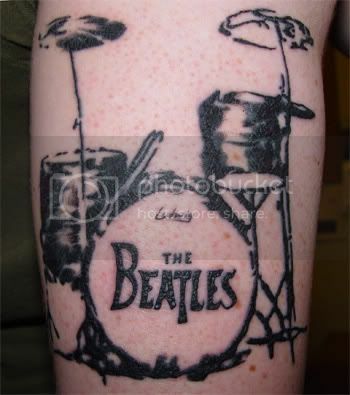 I don't want a tatoo, but if I did I would pick that one because I also play drums and I luv the beatles. Challenge Drummer93091 in the Arcade! Challenge i one dead in the Arcade! Sounds interesting, i one dead! Be sure to post that pic! I have tattoos, but I don't have a Beatles one. One of mine is just above my left ankle. It was my first one & it didn't bother me at all to get it. I had way more work done on it & got a second on my lower back. I'm trying (if it will stop snowing long enough) to get my third on my upper back. I think some great ideas for Beatles tats have been mentioned! I think the band's name (logo) is cool! Or their signatures... Hmmm, the With the Beatles cover would look cool, too! I am going to get a tattoo of John Lennon's self-portrait (in colour) on the lower right side of my back with the words 'Living is easy with eyes closed' around it. Challenge Tesserella in the Arcade! Drum, I like your tattoo. One fan, Ms. Beatle_soul will flip over it. She's a Ringo fan and will no doubt want a tattoo like yours. Anyway, I have a Yellow Submarine on my right shoulder blade, and an apple in the middle of my lower back. I promised my Beatlefriend who passed away recently that I'd get a Butterfly in her memory. I've been looking for a nice pic of one from Yellow Submarine. Oh, and that drum tattoo is awesome. This post is giving me some great ideas. I'd like to get a tattoo done at some point in my life and it's defantly going to be Beatles. Challenge Miss Emily in the Arcade!